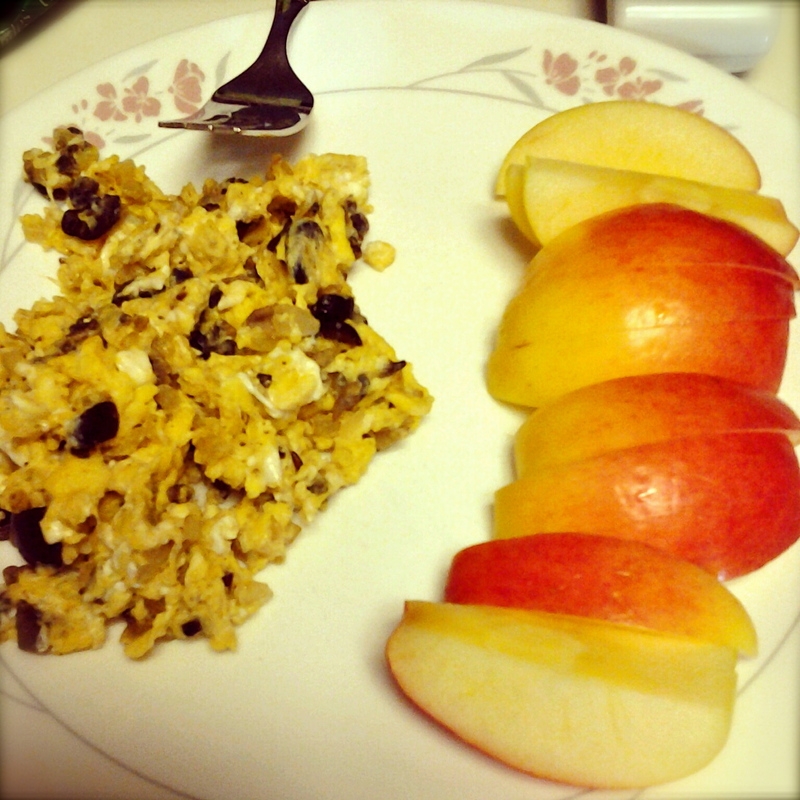 Scrambled eggs with onion, mushroom, black olives, feta cheese, garlic salt, and black pepper. Paired with an apple and a glass of 1/2 water, 1/2 cranberry juice. Deeeelicious. Now, on to the fun stuff. For one of my classes, we’re having an “end of the semester celebration” in which everyone is bringing different snacks, baked goods, drinks, etc. A little reminiscent of elementary school, but you won’t see me complaining! With Monica‘s wedding coming up this week, I wanted to bake something fast and easy (and scrumptious, of course), so I turned to one of my favorite brownie recipes. 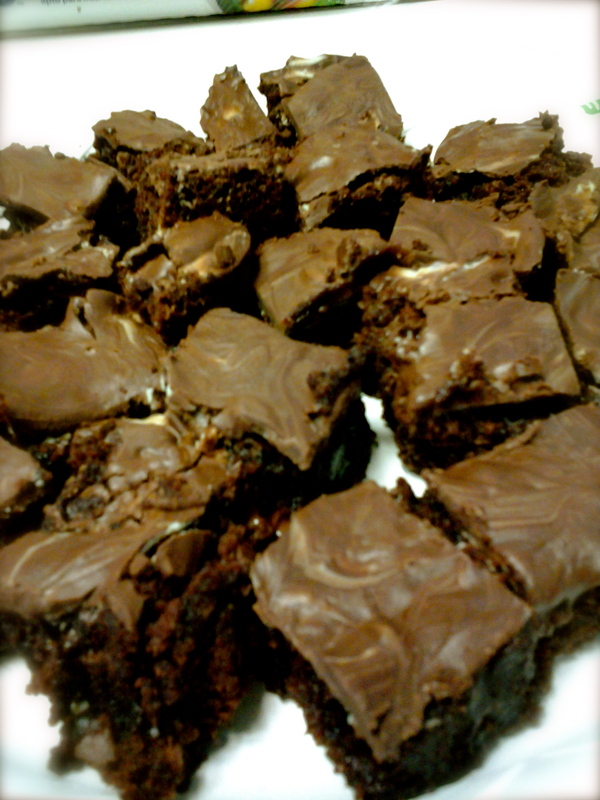 Years ago, my friend Alex discovered how to make these (after repeatedly requesting them in care package form from her friend’s mom in college…she eventually realized how easy they were to make and started making them herself), and the moment she shared the recipe with Tracey and me, they became our go-to mint brownies. They’re made with a no-fail recipe that is guaranteed to make everyone around you ask you for the recipe! You can tell them, or you can act like it’s a top-secret family recipe that has been passed down for generations. These are so amazing and decadent that people will actually believe you. You start out with a box of brownie mix (or your favorite brownie recipe) and a bag of Andes Creme de Menthe Baking Chips. 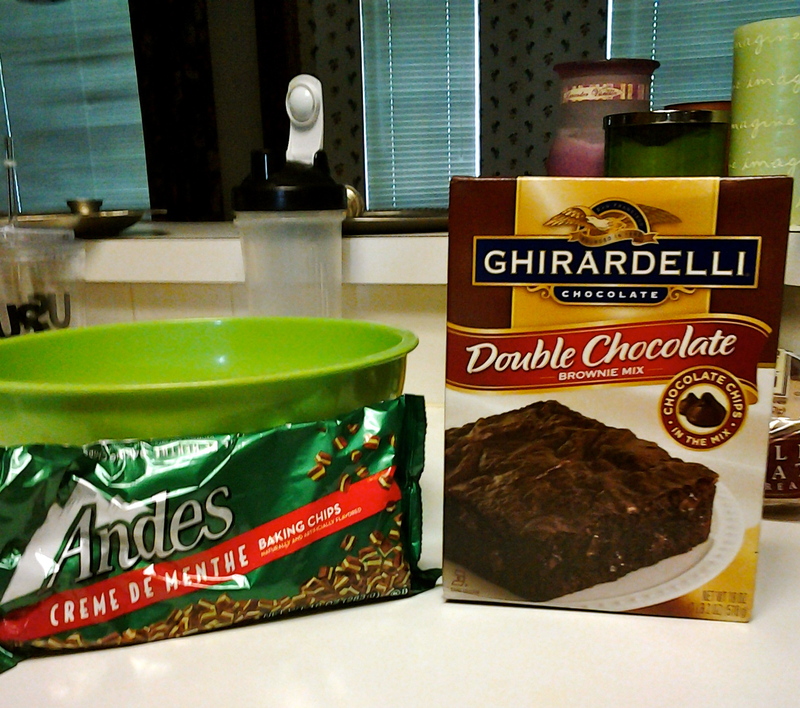 My favorite brownie mix is Ghirardelli Double Chocolate Brownie mix–it comes with chocolate chips in it! Holy chocolate overload deliciousness. Follow the instructions for the brownies (mine called for 1/4 cup water, 1/3 cup vegetable oil, and 1 egg), then pour half of the bag of Andes Baking Chips into the batter and mix to combine. Pour the batter into a baking pan, then bake according to instructions. After the brownies are baked, pour the remaining Andes Baking Chips on top. Let them sit for 30 seconds or so until they become a little melty, then use a spatula to swirl the chips around until they fully cover the brownies. Let cool for about 2 hours, then enjoy! If you like the combination of mint and chocolate, then these brownies are your new best friend. Your second best friend may be a glass of milk, because it goes perfectly with these babies. These were a HUGE hit! One of my classmates said that it was “the best thing he’s ever put into his mouth.” I came home with an empty plate and a smile on my face! This entry was posted in Food, Recipes and tagged andes baking chips, andes mint brownies, andes mints, black olives, breakfast, brownies, chocolate, delicious, dessert, easy, easy mint brownies, eggs, feta, ghirardelli, mint, mint brownies, mushroom, onion, recipe, recipes, scrambled eggs, simple, sweet. Bookmark the permalink. I have a recipe similar to this that I make into a cake… I need to try it as brownies now! I must know this cake recipe!! And yes, you absolutely do need to try it in brownie form–let me know what you think! For the cake I take a box mix and prepare it according to plan. I pour half of the batter into a bundt pan, sprinkle half of the package of mints in and then add the rest of the batter. Once baked I flip it out while still a little warm, slightly melt the rest of the mints and pour it over the top of the cake. It forms a bit of a hardened layer and is really good. Oh goodness, that sounds incredible. Thank you for sharing! Jeez that sounds delicious! So do the eggs, too! What a fun mixture. Going to try those scrambled eggs ASAP! Oh I highly recommend the eggs. They were so goooood! Let me know what you think!